I finally got around to going through the books at school to look for the handprint books I told you about before. Both of them are really good resources with lots of fun easy to make activities for all kinds of holidays and seasons. All the instructions are really very clear and the pictures are great too. The first book I have is called "Handicrafts," by Rosie Wermert and Marie McClurg, illustrated by Bari Weissman. It was published by Learning Ladders/Random House in 1989. I couldn't find a picture of the book anywhere, but I found one link. 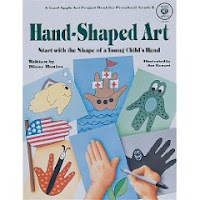 The second book I have is called "Hand-Shaped Art," by Diane Bonica, illustrated by Jan Renard. It was published by Good Apple, Inc. in 1989 also. I found this book on Amazon. This looks like a great book! Handprint crafts are so great for little ones to preserve memories! I'm going to post one of my favorite angels of my oldest when she was just 3 years old, so stop over to take a peek when you get a chance!!! Take Care!! Keep up the great posts- I'm lovin' them! !